To facilitate construction of the station, existing Madison/Wabash Station will be closed. 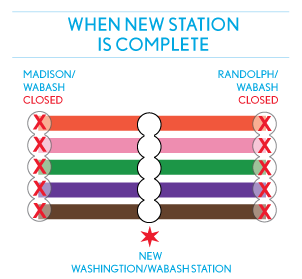 The adjacent Randolph/Wabash will remain open during construction and will not be removed from service until the new Washington/Wabash Station is opened. During construction there will be some slow zones. Intermittent track closures will be necessary during select off-peak periods to reconstruct portions of track structure. CDOT is working closely with CTA to help minimize the impact of construction on CTA service. Stay up-to-date on the Washington-Wabash Station by visiting our CTA Updates page. Portion of Wabash Avenue will be closed during select periods to facilitate construction of the new station. In order to minimize traffic impacts and detours, associated signage will be in place to clearly indicate alternate routes and restrictions during construction. Sidewalks will remain open and accessible to all buildings and businesses. Up-to-date commuter updates can be found on the CTA Updates page.